May 27, 2015 (COLUMBIA, S.C.) – Executive Chef Wes Fulmer of Motor Supply Co. Bistro, one of the Midlands’ foremost Slow Food restaurants, announces 13 featured purveyors – and menu teasers – for Harvest Week, June 16-21, 2015. Harvest Week features an all-local, farm-focused dinner menu of artfully crafted dishes honoring fresh S.C. ingredients and the farmers behind them, as well as a limited edition Harvest Week Cocktail List. Motor Supply hosts Harvest Week annually to celebrate the restaurant’s year-round relationships with small, local and sustainable Midlands farms. Meet the Farmer Happy Hour will jump-start Harvest Week on Tuesday, June 16, from 5:30-7:00 p.m. Head Barman Josh Streetman will debut his eccentrically delicious Harvest Week Cocktail List for guests to enjoy while mingling with local farmers. Each cocktail is specially designed to highlight the flavors and ingredients of each farm, and to complement the dishes coming out of the kitchen. Carolina Heritage Farms: Heritage pork from Pamplico, S.C.
Doko Farm: Slow Food “Ark of Taste” listed Heritage meats from Blythewood, S.C.
Freshly Grown Farms: Hydroponically grown produce from Columbia, S.C.
Heather’s Artisan Bakery: Homemade breads from Cayce, S.C.
Indah Coffee: Premium local coffee, roasted in Columbia, S.C. Lever Farms: Certified SC-grown strawberries from Pomaria, S.C. Trail Ridge Farm and Dairy: “Famously delicious” dairy from Aiken, S.C.
Watsonia Farms: Organic fruit grown by four generations in Monetta, S.C.
West Ridge Farms: Premium, grass-fed beef from Little Mountain, S.C.
Wil-Moore Farms: Free-range poultry and grass-fed beef from Lugoff, S.C.
Diners can expect to see a twist on a ravioli entrée, free-range chicken dish, Manchester Farms’ quail appetizer, crispy pork belly small plate and more. Fresh strawberries from Lever Farms and peaches from Watsonia Farms will star on the dessert menu. Motor Supply is dedicated to supporting sustainable organic and near-organic farmers in the Midlands and regularly buys their meats, poultry, dairy, eggs and produce for the daily-changing lunch, dinner and brunch menus. 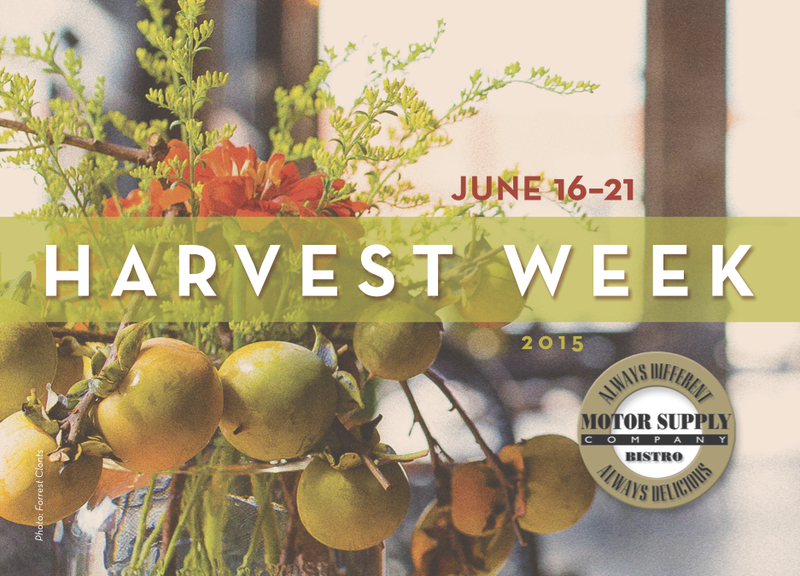 Summer Harvest Week 2015 marks the eighth occurrence of Motor Supply’s signature farm-to-fork event. Known for its artisan cocktails, refined yet relaxed atmosphere and daily-changing, chef-driven menu of sustainable, farm-to-table fare, Motor Supply Co. Bistro has been serving New World, made-from-scratch cuisine in the Vista since 1989. Reservations can be made by calling 803-256-6687 or by visiting www.motorsupplycobistro.com/reserve.